CalAgJobs was proud to attend the World Ag Expo in Tulare from February 14th through the 16th. While there, we had three main objectives: promote our California agriculture internships listings, connect with more employers and job seekers, and to collect $15 donations for “We Grow It All In California” t-shirts to benefit the California FFA Association. Shannon Douglass, the Director of Outreach at CalAgJobs, put on a “Career Hunt Essentials for College Students” seminar where she provided them information and tips about finding a career in agriculture and importance of internships. The students left the seminar with confidence and excitement about their future careers in agriculture. If you would like to watch this seminar, you can find Facebook Live Videos of it on our Facebook page. We were able to meet and mingle with college students, job seekers, employers, and many others at our booth in Pavilion A. We talked with many of you about our internship and job listings that can be found on our website and handed out pamphlets with our internship and job information. The traffic at our booth was excited to support CalAgJobs and California FFA by donating $15 to receive a “We Grow It All In California” t-shirt, designed by our Marketing and Communications Director, Miranda Driver. Miranda designed the shirt prior to World Ag Expo, researching crops grown in California and created the shape of the Golden State. The shirt was made to showcase and promote California agriculture and the hard working farmers and ranchers who work everyday to provide us with an abundance of food and fiber, while also giving back to the next generation of agriculturalist in the California FFA Association. The “We Grow It All In California” t-shirts were a huge hit at World Ag Expo and online. Together, we reached our goal of selling over 500 shirts totaling over $5,500 being donated to the California FFA. 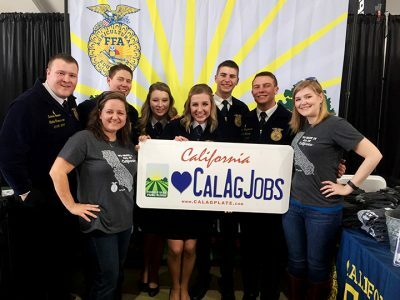 Thank you to all of those who came by our CalAgJobs booth and to those who bought a shirt, both online and in-person, to support California Agriculture and the California FFA Association.